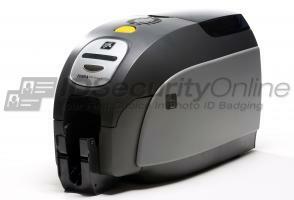 Zebra ID Card Printers answer the needs of organizations of all sizes and industries with innovative ID Card solutions. Large input hopper - holds up to 200 cards. WHAT ARE THE DIFFERENT MODELS OF ZEBRA ID CARD PRINTERS? 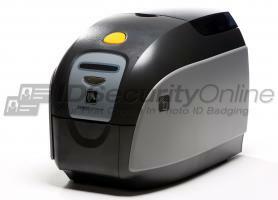 Zebra ID card printers are built to exceed your expectations. Reliable, durable and powerful, this range of ID card printers is a reference in performance at a great value. ZC100: Compact single-sided card printing in color or monochrome with easy setup and use, a self-adjusting card feeder, and fool-proof ribbon changes for simplicity and efficiency. ZC300: Prints complex cards of any design with ease�single- or dual-sided�in any color, and even embeds security marks with ground-breaking simplicity, at a low price point, in a fits-anywhere package. ZC350: Creates any simple or complex design for dual/single sided cards with advanced printing options for all card types. Push-button simplicity and speed supports virtually all encoding technologies. ZXP Series 3: Compact and affordable, this single or dual-sided printer is ideal for small and medium businesses that need high-quality badges on demand. ZXP Series 7: Available with single or dual-sided printing and lamination modules, the ZXP Series 7 is perfect for high-volume or high-security applications. 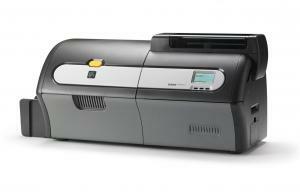 It is also the fastest card printer on the market! ZXP Series 9: Meets high-security application needs and delivers photo-quality designs/images on true edge-to-edge cards, even over irregular smart-card surfaces, reliably and at the fastest print speeds. 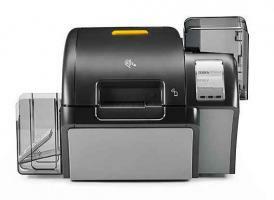 WHICH FEATURES SHOULD I CONSIDER WHEN BUYING A ZEBRA ID CARD PRINTER? Direct-to-card printing vs. retransfer: Zebra offers direct-to-card printers but for over the edge printing, retransfer ID card printers are also available. Retransfer Zebra ID card printers provide unmatched print quality, even on uneven surfaces (proximity cards, smart cards, or pre-punched cards). USB vs. Ethernet: Zebra ID card printers come with USB connection but if your printer will be on a network, don�t forget to select a printer with Ethernet connectivity. Basic vs. encoding options: if you need to print and encode data on magnetic or smart cards, opt for a card printer with the right encoder. All Zebra ID card printers offer optional encoding capabilities. Single vs. dual-sided lamination: some Zebra ID card printers offer single or dual-sided lamination modules. Laminating your cards helps reduce the risk of counterfeiting and tampering while extending the lifespan of your cards. WHICH TYPES OF LAMINATES DO ZEBRA ID CARD PRINTERS USE? Zebra ID card printers are equipped with single or dual-sided lamination modules to add a layer of protection to your printed cards.